AskAlan mailbag: Was the Tiger vs. Phil showdown a bust? #AskAlan mailbag: Was the Tiger vs. Phil showdown a bust? How much of a car crash was 'The Match' as seen in the USA? Viewed as a total disaster from Great Britain. [email protected] Boy, I’ve rarely seen a group of people hate anything as much as the British golf press despised The Match, and that was before it was even played. Sure, it was a vulgar display of American excess, but otherwise rather harmless. I read a million tweets about The Match from golf fans and pundits and nearly that many words typed by my esteemed colleagues and I think the overall impression, which I share, was this: Eh, coulda been worse. Yes, the PPV platform was a disaster, the course borderline kitschy, the golf mediocre, the mic’d up patter awkward, the makeshift par-3 to end things absurd, but the back nine was undeniably exciting as these proud champions were grinding so hard to beat each other. There are a million ways it can be improved going forward, but I think this first try was just entertaining enough to prove the concept has some merit. Did The Match meet your expectations coming out of your breakfast with Phil a few months back? #AskAlan [email protected] That avocado toast summit is what led to me breaking the story about The Match. At the time it was very early in the process and many of the specifics and parameters were still coming together. But what I took away most from that morning was Phil’s giddiness at the concept and his belief that The Match would reinvent the way golf is consumed by fans. Per the second point, I think it proved the opposite: the telecast had many longing for the production values of the established TV networks, and the much ballyhooed aspects of the presentation – mic’d players and real-time betting odds – fell flat. But if The Match succeeded at all it was largely because of Phil’s gee-wiz enthusiasm and the intensity of his play, and he had broadcast that ardor to me months earlier. Tiger Woods and Phil Mickelson shake hands during the afterparty for The Match. Any word yet about Tiger’s health? Back looked stiff, visible neck problems, permanently in pain according to his face, even seen having treatment in the background, swallowing what was most likely a painkiller, holding and flexing left knee repeatedly... #askalan #sumtinwong [email protected] Ya know, I also thought he looked a little stiff out there. That doesn’t mean there is any big update forthcoming – he’s 42 and fused, and in a moment of candor earlier this year Tiger said there are some days when his body just doesn’t feel great. Maybe Black Friday was one of those unfortunate occasions. Why of all things did Shadow Creek present itself with obviously recently aerated greens which apparently were terrible to putt on? #askalan [email protected] This will go down as one of the most burning questions in the history of grass, right up there with the USGA’s decision to not water the greens at Shinnecock and what exactly Ty Webb was smoking in Carl Spackler’s shed. When can the PGA Tour be infiltrated with young modern minds? We need them to take chances, not give us Peter Jacobsen and the dreaded CBS crew that caters to an outdated audience and thinks tape delayed golf is still an option. -Bill (@DJohnsonsSWAG) This is a running gag with my friends and I. All of the bad ideas in the world seem to be the fault of old white guys, and just when one batch of these misguided decision-makers is put out to pasture they are replaced by…more old white guys. It is the most sustainable resource in the world. We were saying this 20 years ago. Ten years from now we ourselves will be old white guys. Will we suddenly turn into grouchy point-missers who perpetuate more bad ideas, or is the revolution finally coming? Stay tuned. People were speculating that Tiger and Phil agreed to split the $9M ahead of time. I'd like to think they didn't but each agreed to a percentage of the PPV take, similar to movie stars getting a cut of the box office. Did you hear any rumors like that? Also, I think the main reason Tiger lost the match was because he couldn't swear. He was so outside his comfort zone having to worry about what he could/couldn't say. Agree or disagree? #AskAlan -John (@jkellgrew) In the old days on the PGA Tour it was common for the participants of a playoff to agree to split the money, on the theory that they had tied for first place and both deserved an equal share of the spoils. One of the more underrated acts of gamesmanship in golf history came on the morning of the playoff at the 1962 U.S. Open, when Arnie asked the young, brash Fat Jack if he wanted to split their winnings and Nicklaus declined. 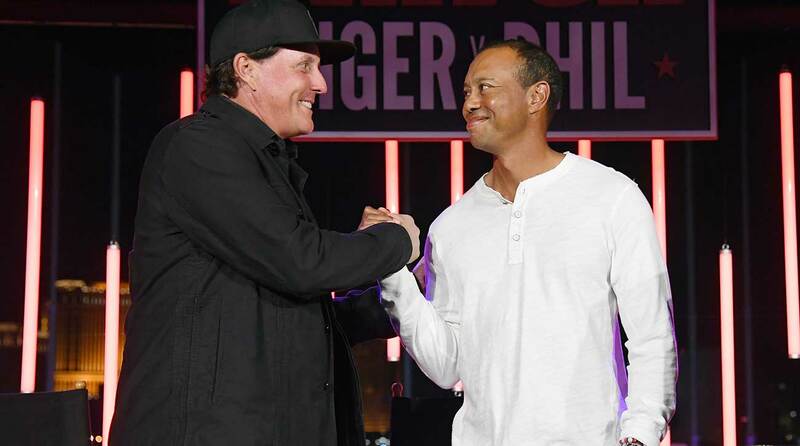 Anyway, it would make a certain amount of sense if Tiger and Phil agreed to split the dough, given that they were co-headliners, but only they know for sure. But even if that didn’t happen Tiger still earned a nice chunk of change from the rights fees and merchandising. He and Phil are co-owners of this franchise and they are taking big gulps from every revenue stream. As for Tiger’s potty-mouth, I agree it was fascinating/torturous to listen to his G-rated mumblings during his struggles on the front nine. Not sure it cost him the victory but your larger thesis is correct: this just wasn’t Tiger’s cup of tea. He’s an introvert and a grinder. Phil is a showman and clearly was enjoying himself while Tiger looked like he had a bad case of buyer’s remorse. #AskAlan will either Jordan or Rickie or both get a win in the 2018/2019 season? [email protected] Spieth for sure. Ten victories from 2015-17 is no joke. He knows how to win, and one bad season doesn’t change that. And Spieth has one of the highest golf IQs on the planet. He’ll learn from last season and be better for it. It’s hard to predict Fowler’s form from year to year – in a decade on Tour he has only four wins (plus a pair on the Euro tour). He was spectacular at this year’s Masters but couldn’t build on it. As for the coming season, I’ll say a Rickie victory is a definite maybe. How do I break 90 for the first time before New Year’s Day? #AskAlan -Quinn (@Q_Brunk) Since I know nothing about you or your game let’s speak in a few generalities. For mid- to high-handicappers the key to lowering your score is eliminating blowups, and more specifically, three-putts, penalty strokes and double-chips. Outside of 15 feet you’re almost never going to make a putt, so stop trying – just lag it up there, take your two-putt and move on, rather than charging it six feet by and blowing the comebacker. Are you short-sided, behind a bunker to a tucked pin? You’re not nearly good enough to try to get it close! Just smash a wedge shot way past the flag and grind for a bogey while taking triple out of play. On a tough driving hole with O.B. or red stakes, don’t hit driver. Shoot, don’t hit 3-wood! Try a hybrid just to safely get the ball in play and then navigate carefully from there. The easiest way to go from shooting 95 to 89 is basic course management. First tee walk up music... Yeah or nay? -Ryan (@mantheybrewcrew) Depends on the tournament. It would be awesome at the Phoenix Open but feel out of place on Riviera’s stately first tee. Players? Yes. Pebble? No. New Orleans? Definitely! Hilton Head? Nah. You get the point. Odds of and thoughts on Phil completing the grand slam next June?? He was breathing awfully heavy even on the first hole during the match!! [email protected] In fairness to Phil, it was the day after Thanksgiving! And Las Vegas is at 2,000 feet of elevation and the desert air is awfully dry. But more than that, I think his shortness of breath was because of the built-up nerves. It was more about feeling jittery than out of shape. The Match meant a ton to Phil, and it showed in his (mostly) inspired play. The 2019 Open at Pebble Beach is probably Phil’s last stand. He’s an emotional golfer and plays his best when he feels inspired by the venue. Well, Mickelson has won four Clambakes at Pebble and there are few places on the planet he loves more. The course will play so short that few drivers will be needed, which obviously helps Phil. Iron play remains one of his strengths and with its tiny greens Pebble is the quintessential second-shot course. After the Beach the Open goes to big brawny courses like Winged Foot and Torrey Pines, where hitting driver long and straight will be a necessity. If Phil, 48, doesn’t get it done next year I’m afraid it’s never going to happen. Apparently there are changes coming to the OWGR. What would you like to see changed? More emphasis on winning? One year ranking period? Hero World Challenge not getting ranking points? [email protected] No fair, you took all the easy answers!